The Homer Laughlin 12132100 RE-21 plate has a large diameter of 121⁄4 inches that is ideal for main course dishes, like chicken, fish, and steak. A wide rim makes servings look larger, reinforcing the idea of value for your customers. Since the dish comes in ivory, it easily fits into any establishment and pairs well with other colors. 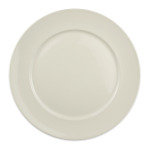 The Homer Laughlin 12132100 RE-21 plate is made from durable china, enabling it to resist chipping and scratching.